Martin Buber’s I and Thou argues that humans engage with the world in two ways. One is with the attitude of an ‘I’ towards an ‘It’, where the self stands apart from objects as items of experience or use. The other is with the attitude of an ‘I’ towards a ‘Thou’, where the self enters into real relation with other people, or nature, or God. Addressing modern technological society, Buber claims that while the ‘I-It’ attitude is necessary for existence, human life finds its meaning in personal relationships of the ‘I-Thou’ sort. 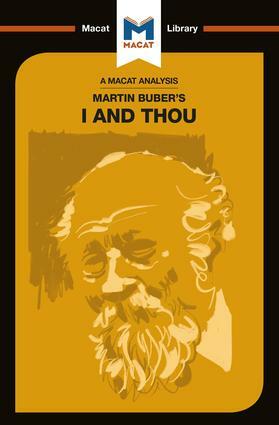 I and Thou is Buber’s masterpiece, the basis of his religious philosophy of dialogue, and among the most influential studies of the human condition in the 20th century.